das Blog: Ick koof mir doch 'n Bier! Ick koof mir doch 'n Bier! If you've spent some time learning German before coming to Berlin (and I hope you do!) then you might be surprised when you listen in on the locals and they seem to be speaking a totally different language. Sometimes it seems almost like Dutch, especially when you hear the hard Berliner 'ick' for 'ich'. This isn't so surprising, as the Berliner dialect ( Berlinerisch ) is a variant of Plattdeutsch, or Low-German, spoken across northern Germany (platt means flat / level / plain) and the eastern parts of the Netherlands. The dialect also incorporates corrupted French words, from the time when 1 in ten Berliners were of Huguenot origin, Sorbian and Slavic words, Turkish, and a smattering of Russian. 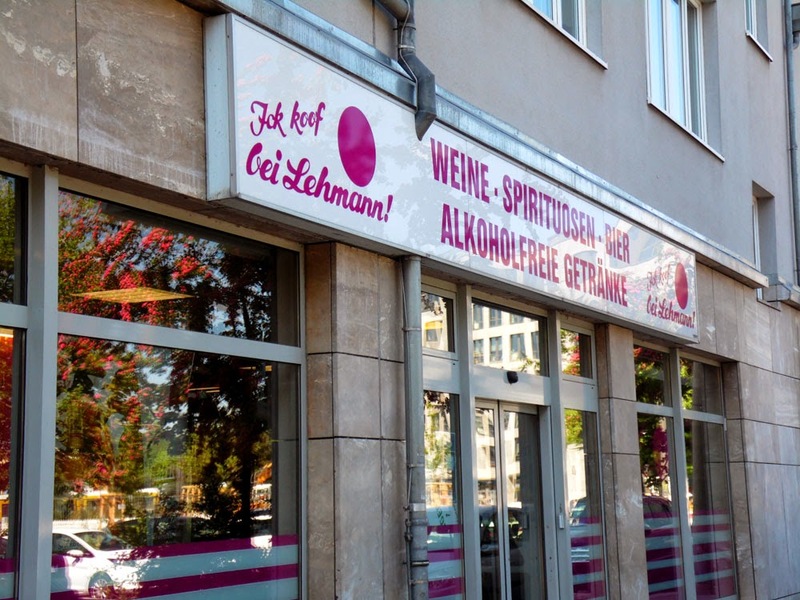 This cheap-and-cheerful Trinkmarkt , of which there are about 15 outlets around Berlin and Potsdam, has the slogan "Ick koof bei Lehmann!". Koofen is Berlinerisch for kaufen, so the slogan means "I shop at Lehmann!" There are other Berlinerisch shibboleths too; for example the verb kiek'n instead of gucken (to look) and using the y sound (written j in German) instead of the hard g in words such as jut (gut = good), jurken (gurken = cucumbers), and jejen (gegen = against), as well as grammatical differences (often using the dative - dir for example - instead of the accusative dich, e.g. ick liebe dir!). It all makes learning and understanding German in Berlin that bit more colourful. Never mind when you encounter Kiezdeutsch as well - a mixture of Turkish, Arabic, German, and Black American slang - which all the cool young dudes speak. What is particularly interesting is that early Low German was the language spoken by the Saxon settlers in Britain, and so is the root of English. So in fact, when you hear the Berlin dialect, you are hearing something more akin to what Chaucer would have understood than the Hochdeutsch they speak on the German news TV channel. One more little thing; whilst looking around the internet to see how much Berlinerisch is used in the wriiten medium, I kept coming across the name of a kneipe near the Zionskirche in P'berg called "Ick koof mir Dave Lombardo, wenn ick reich bin" - which translates from the Berlinerisch as "I'll buy myself Dave Lombardo when I am rich" Wonderful! (Dave Lombardo is drummer with the thrash metal band 'Slayer'). Don't know what the place is like, but I love the name!